This bureau bookcase consists of a cross grain moulded cornice leading down to a glazed door with key with a shaped moulding typical of the Queen Anne period, the door opening to reveal two shelves and five pigeon holes with shaped dividers, the shelves and back boards finished in a green paint as used on period pieces. This leads down to the bureau, the fall of quarter veneered figured walnut wih inlaid herringbone decoration and decorative brass escutcheon. The fall opens to reveal a fitted interior consisting of an arrangement of open shelves and four small drawers with brass drop handles. Below the fall, the four oak lined graduated drawers are of figured walnut, herringbone stringing and cross banding with brass swan neck handles and decorative escutcheons leading down to a moulded edge, all supported on four shaped bracket feet. 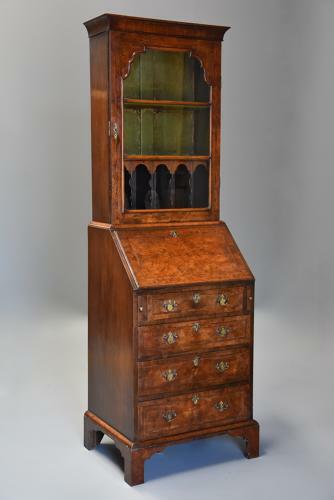 This bureau bookcase is in excellent condition for age, is of stable construction and can go straight into a home - considering the age of this piece the rich, warm patina is superb and is comparable to that of period Queen Anne furniture.